Da Capo Lifelong Books, 9780738215082, 296pp. We live in a time when kids of all ages are bombarded with age-sensitive material wherever they turn; “sexting” and bullying are on the rise at an increasingly younger age, and teen moms are “celebrified.” What is a concerned--and embarrassed--parent to do? With wit, wisdom, and savvy, Deborah Roffman translates her experiences gleaned from decades of teaching kids and parents, and as a mom, into strategies to help parents navigate this tricky terrain. 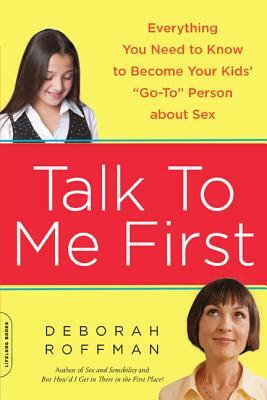 Talk to Me First is for any parent who wants to become and remain the most credible and influential resource about sexuality in their children’s lives. Deborah Roffman is a former member of the National Advisory Council for Sexual Health. Her work on childhood and teen sexuality has appeared in the Washington Post, Los Angeles Times, and Boston Globe. She lives in Baltimore, Maryland.